Ready in 25 minutes. Ready in 25 minutes. Garnish with a few sprinkles of parsley for a touch of color. 2. While pasta is cooking, trim fat from meat and cut into 1 x 1/2" pieces. Spray a large skillet with vegetable cooking spray. Heat skillet over medium-high heat until hot. Add beef and stir-fry 3-5 minutes until outside surface is no longer pink. Remove from skillet. 3. In the same skillet, add the olive oil and heat until hot. Add the onions and mushrooms and cook until tender, about 2-3 minutes. 4. Stir in the flour. Gradually add 1 cup beef broth, stirring until blended. Bring to boil. Cook and stir 2 minutes. Return beef to skillet and heat through. 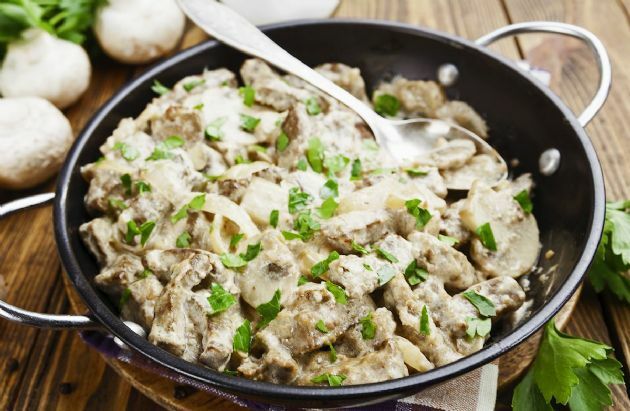 If stroganoff appears too thick, add more beef broth to thin as desired. Serve beef mixture over pasta. Add dollop of sour cream, if desired.